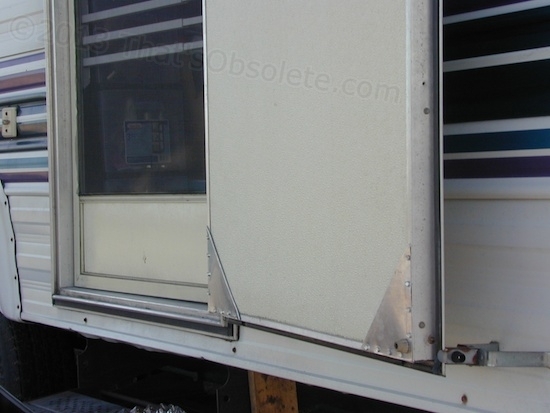 Doors on RVs are a big deal. A replacement for this one would have to come from a salvage yard. So, I’d have to do what I could on this one. 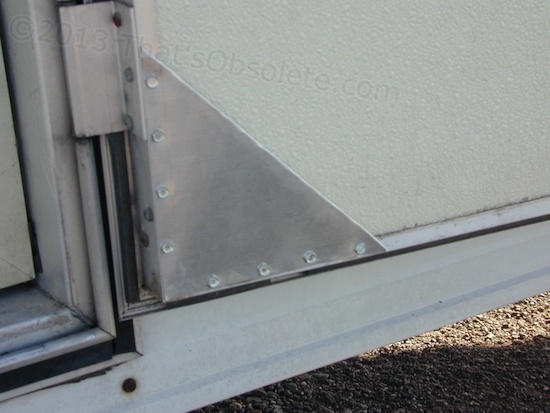 A couple of corner brackets might be enough to tie it all back together. I could put them inside only, so the trailer wouldn’t look too hillbilly from the outside. I had a bit of sheet aluminum from the water heater vent shield that didn’t work very well, so I broke out the cheapo-knockoff paramedic shears I use in the kitchen. They didn’t work very well to cut the aluminum, but they did work. I did lack small sheet metal screws, though. So I hopped on the bike and headed for the small hardware store in town before they could close on me. Presto, found just what I needed for $2.40. I noted their prefab corner brackets they had just in case my fake-up failed to really take care of the issue, and cycled back. Goal: get the door basically happy before sunset, because today’s on-again, off-again wind made it very undesirable to try to leave the door open overnight. I’m pretty slow when I do things. I like to say that I prefer to take it easy and enjoy the process. But really, I’m just slow. Still, I realized that the raw edges of the aluminum would probably slice a nice wafer off me sometime when I least expected it, so I bent one edge and folded it over on itself to become non-lethal. The other edges would hug the doorframe and were comparatively shielded. Measured out and drilled the new corner pieces for fasteners. Held them in place and drilled the doorframes. Screwed everything together, and then put everything away. 5:30. Still an hour to spare. Yea! Okay, so it doesn’t look factory, but it’s not too bad. The door opens and closes like it never has. Like it’s supposed to, actually. Nice and crisp. I will be exceedingly curious to see if removing the support jack under the door influences it at all. I like to think that there’s a possibility that the weight around the doorway opening was a red herring, and that the door itself was reacting to something – like falling to pieces. On the trip down here, I twice had to literally pry the door open with a screwdriver, and had to reset the latch several times just to get it to close again. Not the happiest thing to do in a Walmart lot with a load of groceries waiting in a cart. See, the jack under the door seemed to help door function in general, but not at all consistently. I’ve been assuming that the doorway opening has been shifting. Maybe it is, but this little fix on the door itself might outweigh that. I just backed off on the jack, and its still works great. Too soon to tell now, though. Only the stresses of travel and parking on different surfaces will tell the story for sure. Still, as of today, me happy!